Social media has become an inseparable part of online business and as such it should be a high priority for you when you setup a new website. The social link integration settings are a bit hard to find and you will them in their usual place - System or Settings menus but this is when we come in. In order to change the Social Media URLs in your website’s footer you will need to login to your admin area and navigate to the Extensions section of your main admin panel. Now click on the cogwheel icon next to the Templates option. As you can see from the breadcrumbs we are in section of the website’s settings which are not accessible via the usual System Menu. Scroll past the general options and you will see the Social links section. Here you will be able to enable or disable the visuals representing the icons and of course adding your social media links. After you click on the Save Changes button, you will be able to see the change if you hover over the icons in your footer. 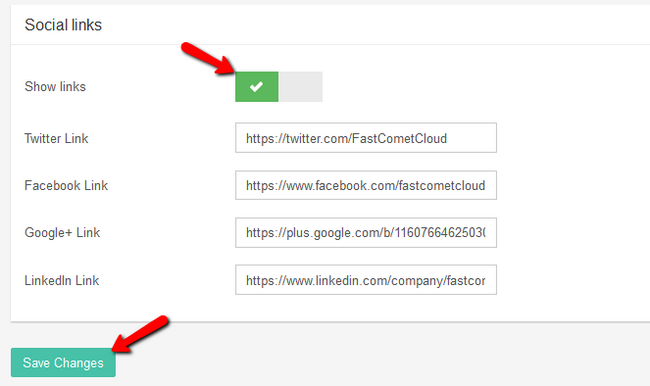 You now know how to change the social media links for your website. Congratulations.